I’ve written previously about both the distinction and the importance of the distinction between concrete and abstract nouns. But there’s more on my mind about such things that I’d like to share. I’ve always found the concept of abstract versus concrete nouns strange and somewhat confusing. After all, there is no grammatical difference between a concrete and an abstract noun. They function exactly the same way. 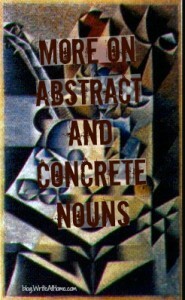 Whether a noun is abstract or concrete is a purely stylistic consideration. This is because the difference depends not upon the word itself, but upon the object or concept the word refers to. In fact, concrete noun is an oxymoron, and abstract noun is redundant. All nouns, as words, are abstractions. Words are ideas that we represent via sound or symbol. A word can be perceived by the senses, sort of — spoken words can be heard and written words can be seen, but they do not have physical existence. What makes a word a word is not that it can be pronounced or spelled, but that it has meaning, which is an abstraction. Bbupcvx, for example, is a grouping of letters, but not a word. It only becomes a word if I give it meaning. I can decide, for example, to name my pet pygmy marmoset Bbupcvx and, voila, it becomes a proper noun. But there is nothing concrete about the “word” Bbupcvx. All this just shows that nouns, and words in general, are more than just lines on a page or collections of uttered sounds. They are lines and sounds that mean something. And that is a necessarily abstract idea. So, in this sense, no noun can ever really be concrete. But that’s not what we mean by concrete noun anyway; we mean a noun that names something concrete, as opposed to an abstract noun, which is a noun that names something abstract. I don’t like this blurring of sign and signified. I posted a video some time ago about how I learned that a noun isn’t “a person, place, thing, or idea” but “a word that names a person, place, thing, or idea” and that there is an important distinction between the two. A rose by any other name is still a rose, after all. A thing always has many names in various languages, yet the thing itself remains the same. A tree would be árbol, baum, derevo, or albero, if you are in Spain, Germany, Russian, or Italy respectively. A noun is a kind of word. I am not a noun, nor are you. Our individual names are nouns because they are words. But there are many people walking the earth convinced that they are nouns because they do not observe the distinction between a thing and its name. Despite my objections, I accept the terms concrete and abstract nouns. They are what they are. And making the distinction is sometimes useful. Most nouns fortunately fit neatly into one category or the other. Popcorn, hummingbird, suitcase — these are all clearly concrete (Remember — the thing these words name is what is actually concrete). Justice, philanthropy, and Calvinism, on the other hand, are all obviously abstract. There are many ways this gets tricky, however. And it all starts with how we define concrete. I was taught that concrete nouns were nouns that can be perceived by the senses. That works well enough for the examples above. But what about air, quark, or black hole? These things cannot be perceived with the senses. They are imperceptible and/or theoretical. That’s why I like to think of concrete as meaning “having physical existence.” That way we don’t have to worry about our ability to perceive. But what about Julius Caesar or Henry VIII? These guys don’t have physical existence. Not anymore anyway. What about dragon, cyclops, or hobbit? Imaginative creatures don’t have physical existence, right? But surely centaur better belongs in the category with horse and person than with nouns like honesty or anger. You have to forget about time and reality when grouping nouns. If centaurs were real, they would have physical existence, therefore the word centaur is a concrete noun. Abraham Lincoln once lived and breathed, therefore the name Abraham Lincoln is a concrete noun. It seems to me there is a spectrum of concreteness. Abraham Lincoln is more concrete than president, which is a broader category and therefore more difficult to picture clearly. Man is even less concrete. Creature still less. Cheeseburger is much more concrete than food — which is so broad that it starts to take on symbolic meaning (e.g., food for thought, food for the soul, etc.) which pushes the word toward the borderline of abstract nouns. When asked to identify a noun as abstract or concrete, most people look for evidence of concreteness — typically using the five senses test. I find it easier to reverse the process. Abstract nouns name ideas, concepts, emotions. Intangible things. Words like winter or war confuse people because they seem so perceptible by the senses. You can see and feel winter, right? And war is clearly a visible, audible thing. But both winter and war are concepts. They are names given to a particular time of year or a particular violent disposition of one group to another. What you see is not actually winter or war. What you see, feel, and hear is simply evidence of an abstract concept. Snow and frost isn’t winter — it’s evidence of winter. And charging armies, tanks, planes, and explosions are evidence of war, not war itself. This still doesn’t always simplify things, however. A university is fundamentally an idea. But it can also be a place with physical existence. Art is also a concept, but it’s also possible to refer to a particular work as art, in which case the word becomes concrete. So, context often matters. With some words, I just throw my hands up. Is soul a concrete or abstract noun? Is a soul a real thing with physical existence? Merely an idea? I tend to think of the immortal human soul as a real thing, though without physical existence. That makes it more concrete than abstract. But if we are talking about a musician playing with soul, I think that’s an abstract idea. But if you disagree in either case, fine. It doesn’t matter. There is no authority to look to here. And since I have wandered into theological realms, let me point out that there is at least one reason to care about this concrete/abstract distinction when it comes to spiritual matters. A common point of perplexity among Christians (and non-Christians too, I assume) is the idea of evil. “Why,” I have often heard people ask, “did God create evil?” This, by the way, was a question that plagued even the brilliant Augustine. My answer has long been, “He didn’t.” To many, that sounds blasphemous, since they believe God created everything. But that’s my point. God created every thing. Everything that exists. Evil does not exist. I mean evil does not have physical existence. It is a concept. It has no shape or substance. It is the name we have given to the opposite of goodness or virtue, neither of which exist either in a physical sense. God created the world and all that is in it. But ideas are in the realm of the mind and were not created. The fact that there is no grammatical distinction between concrete and abstract nouns makes it difficult for us to think of them differently. We can say, coffee is good and love is good and there is no grammatical difference. But coffee exists physically and love does not. We can even say “God created marriage” but we are being figurative when we say that. He did not cause it to come into existence in the same way he caused rocks, birds and trees to come into existence. I could be wrong here, but it seems to me that thinking of evil as tangible things that exist in the same way goldfish and cucumbers exist can have some confusing and maybe even harmful consequences. I know this is a bit beyond my usual sphere on this blog, but I’m curious about your responses. Please feel free to leave your comments and questions below. Brian this is a very interesting post. Especially the last few paragraphs as you look at this theologically. Jesus said that the contents of the heart, that is the character of the person, is known by what comes out of their mouth. In the abstract, the speech and the words uttered and written by a person define the concrete. This post has very profound application when we look at the fall of man as narrated in Genesis 3 and the results as applied to all human posterity following Adam and Eve by natural means. I’ve been studying the Westminster Catechism, shorter and larger versions, for several years. The shorter version is geared towards teaching classic, orthodox Christian doctrine to children while the larger version is geared towards adults and instructing them in the faith once given to the saints. For many years I have wondered about assumptions in the texts of both versions and after reading this post of yours I believe I may have found answers to my questions. I believe we have a profound and very damaging ignorance about words and meanings. I also believe that this ignorance is promulgated by those who would radically transform us as a people and have us espouse the emptiness of humanism built on a frame of flowering words and romantic prose. The framers of the Westminster confession, didn’t need to explain assumptions because they and their readers (even the children who would be learning from the shorter catechism by the efforts of their parents) understood this difference between concrete and abstract in theology because they had a sollid Biblical base. Today we don’t have this knowledge, don’t or won’t teach it or we just don’t grasp it anymore. Our language and words have become rather profane in all spheres of life. I’ve just recently started reading Francis Shaeffer’s “How Should We Then Live” and Machen’s “Christianity and Liberalism” again and your post profoundly amplifies what both of these fellows are writing about as one considers the concrete and the abstract in these two books. I don’t know if you are any sort of Christian but would recommend that you also take a look at these two books whether you are or not. I’ve long believed that one of Satan’s greatest weapons against us in his arts is that which denigrates language. We can see everywhere that the use of language spoken, written or symbolized, expresses the ideas of the mind and intents of the heart and can move people to all manner of “evil” in the concrete and the abstract. Again a very interesting and thought provoking post. My wife said this one could easily createa pretzel in the mind when one actually starts to tear it apart critically (abstractly speaking in the sense of earnest contemplation – not that it’s bad – but you probably already surmised that). Wow. Thanks for the thoughtful reply, Tate. I am a Christian and have read “How Should We Then Live” several times. I am familiar with Machen as well, but have not read “Christianity and Liberalism.” I’ll add it to my list. I thought so – someone who isn’t would not be able to connect it the way you did in your post. My wife is an aspiring novelist and has found much in your blog posts to encourage her and she sent this to me earlier today and we had an email conversation about it. You will like Machen’s book very much – it’s a small book but a tough read (it will take me several reads to absorb it I’m sure). I love this post Brian! Think it is brilliant. Likewise darkness does not exist, because it is just the absence of light, and evil has no substance, it is the absence of good. God created light and not darkness. Everything He created was ‘good’ but the possibility of evil came automatically into existence whenever good was absent. Thank you for teaching! I love language. Dutch is my mother tongue and now I’m in South Africa and speak the Afrikaans language. I learned to speak German as well. I enjoy this site! Blessings! Well, I was close until I started second guessing! I enjoyed the post. Thanks! Remember, Heidi, there’s lots of room for disagreement here. I find it helpful to think that some words are “more concrete” than others rather than drawing hard lines. There seems to be a lot of gray here.